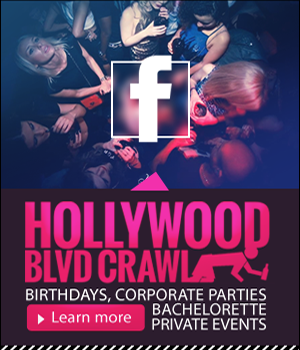 VIP Birthday party crawls are the most popular Hollywood club crawls offered on the Hollywood Blvd Crawl. Do you have a milestone birthday coming up and don’t know what to do? Do you want your VIP birthday party to be THE holiday party to remember? Hollywood Blvd Crawl will provide a dedicated concierge and personal VIP Host to plan and execute your epic birthday party to your tastes and preferences. Our Hollywood Blvd Crawl concierge will leverage a myriad of powerful connections to create an outstanding Hollywood Club Crawl LA nightlife experience with personalized service, and top value. Your VIP Hollywood Blvd Crawl host will personally oversee the entire experience to ensure the affair is truly Epic! VIP Birthday party events are one of the most popular party packages offered on our nightclub party tours. These clubbing packages offer the best of Los Angeles nightlife at top nightclubs in Hollywood. Are you looking for help in planning a birthday night out in Los Angeles and Hollywood area of Southern California? You have come to the right place. We LOVE birthdays and we LOVE Hollywood nightclubs and we have decided to share our club connections and access to the best clubs LA places to celebrate your VIP birthday parties in Hollywood. You will be sure to turn heads when you and your friends walk up to the best clubs LA with VIP nightclub admission and express line by-pass entry into the club! Our staff will give you and your group an amazing birthday pub crawl party pack filled with rock star VIP clubbing LA treatment to make sure it is a night out you and your friends will never forget. And on top of experiencing the phenomenal venues for one price, hassle free and better than a VIP, joining a LA club crawl is the easiest way to meet other party-goers from the entire world! Most nights out there are 1,2 or 300 other crawlers on the guided club tour and our team of fun-loving hosts will introduce you to everyone! Every once in awhile, it’s good to spice things up! Our stories have happy endings and we guarantee you’ll go home smiling…maybe with a new friend or two. Contact us today to find out more about available party packages for VIP birthday parties. VIP Birthday Parties…Make your special day EXTRA special! Whether you want a huge blowout with a night filled with club crawling Los Angeles nightclubs, book VIP table reservations with Birthday bottle service or a private party with close friends, our team of experts can handle any request. Your ticket for VIP birthday parties is your hassle free access to a fantastically prepared schedule of best bars in LA, Hollywood nightclubs and supper clubs. We plan a schedule for you designed to kick start your night and continually build up the energy for as long as you can handle it. Los Angeles is famous for its exclusive Hollywood clubs and opulent nightlife, and we know the secrets of where you need to be. Best LA VIP Club Experience! Imagine walking up to the red ropes at one of the hottest Hollywood clubs, high five the bouncer and breeze right inside. There’s a line a mile long around the block to get in, but you don’t have to wait in it because you are the ultimate VIP! Spend a night as a VIP on the Hollywood Blvd Crawl. Skip the lines and walk right up to the red ropes at the best clubs in LA. Enjoy complimentary drinks, no cover charges with line by-pass express entry, and VIP treatment all night. Contact us for your best party tonight LA night out.